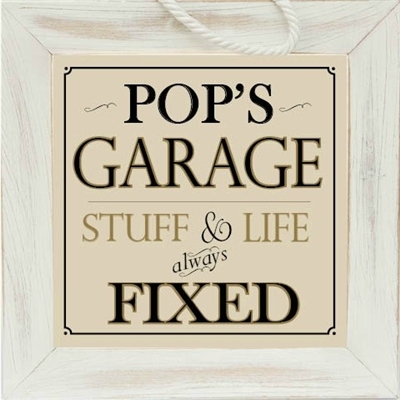 If grandpa loves fiddlin' and fixin' things, he needs this sign! 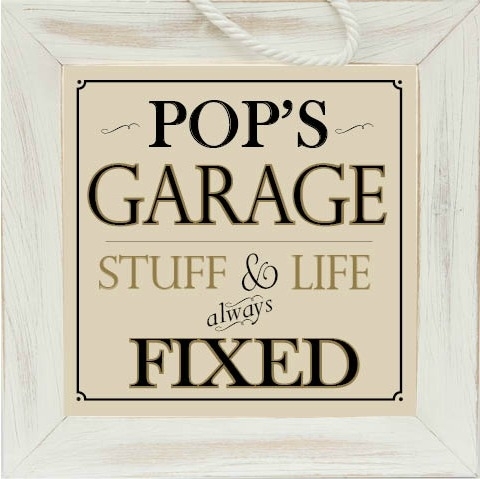 Our personalized Grandpa garage sign will let everyone know he not only fixes stuff, but he fixes a lot more! As my Dad always said, "Life is a maintenance job!" Give Grandpa or Grandpa by another name this 8x8 white distressed frame for his "fixing space". A unique gift for Father's Day for grandpa, Grandparents' Day or a wonderful grandparent Christmas present. Rope for hanging or easelback for tabletop. Comes with non-breakable acrylic front, so that is something he won't have to fix! I ordered this for Papa for his birthday. He will love it! Spends lots of time in his garage; this will look great in it! He is a very proud Papa of our first grandchild!! !